At the House Of Illustration next year there is an amazing exhibition of work by female artists in the comics medium. 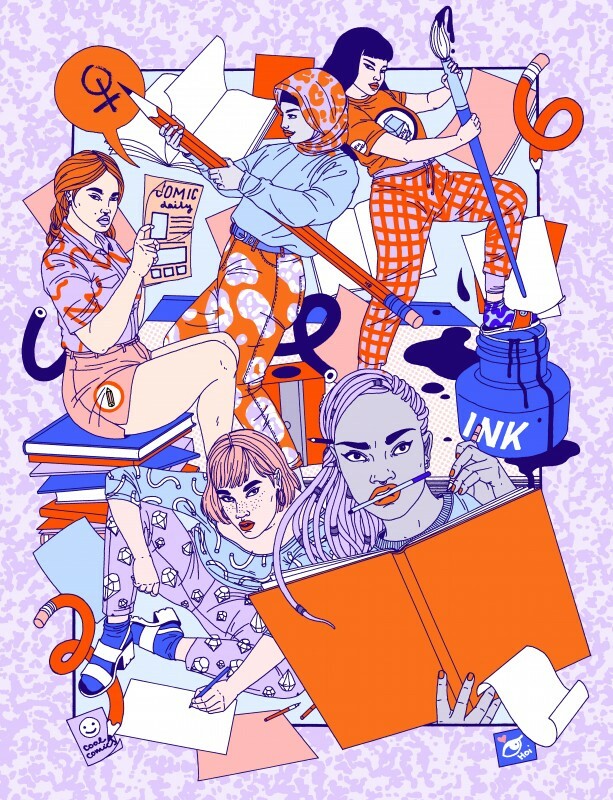 Comix Creatrix: 100 Women Making Comics is the UK’s largest ever exhibition of work by pioneering female artists working in the comics medium. From their early incarnations as sequential satires and newspaper strips, comics have evolved into a complex and powerful literary form. In the 1960s and 70s, comics became a vehicle for countercultural views and political dissent and the 1980s saw the first critical acclaim for the graphic novel. Today, comics exist as award-winning bestsellers, self-published zines and web comics and cover a wealth of subjects from the personal to the political. Female comics have been present throughout this evolution. They have been a prolific minority, creating some of the most defining and provocative works of the medium. However their contribution has often been overlooked. Comix Creatrix presents original artwork from 100 innovative creators – much of it has never been seen in public before – and debunks the myth that women have a limited stake in the world of comics. The exhibition recognises the extraordinary variety of comics by women; from observational comedy to surreal fantasy, challenging biography to subversive protest. Highlighting 21st century work by British creators such as Posy Simmonds, Kate Charlesworth and Simone Lia, the exhibition will also recognise 19th century pioneers like Marie Duval and 20th century countercultural innovators including Trina Robbins and Nicola Lane. It will also recognise the influence of international practitioners including Tove Jansson and Nina Bunjevac. Acclaimed titles such as Audrey Niffenegger’s The Night Bookmobile and Isabel Greenberg’s Encyclopedia of Early Earth, as well as self-published sensations like Nadine Redlich’s Ambient Comics will also be included. Co-curated by House of Illustration curator Olivia Ahmad and guest curator Paul Gravett. House of Illustration, 2 Granary Square, London N1C 4BH. Open Tuesday-Sunday 10am-6pm. Closed Mondays. Admission: £7/£5/£4. Information: 020 3696 2020. houseofillustration.org.uk. @illustrationHQ.